And so ends Chapter 13! UPDATE: New incentive sketch of our favorite mischievous vixen is up! So is she actually there and eavesdropping, or just in a similar-looking area and meant to be a foreboding reminder? Either way, something tells me she’ll be showing up at the ol’ castle. And I hope we find out what happened to Venir, too. Not the same area, look at the roads color and at the plants on the sides. Let the smack down BEGIN!! Sheesh. Why hasn’t Evee killed someone and taken her clothes yet? Not that I’m complaining, mind you. I also like the dappling. Strictly speaking, she’s probably either been conditioned to being clothes adverse, or simply finds clothing to be an unneeded distraction – she did spend “her” whole life naked but for a collar, mostly, and she did manage to destroy an entire fortress of super-mages and monsters easily. In essence, who needs clothing, and why should she give a care about social constructs? Is this what they call an “epic foreshadowing”? Oh, and I agree with Treesong. The view of the sun peeking through the tree canopy, shading and lighting Evee’s fur is wonderfully done! As soon as someone says something like “things are finally starting to go right”, you know its gonna go wrong. Just like in war films where a guy who has just got married or had a son end up dying. 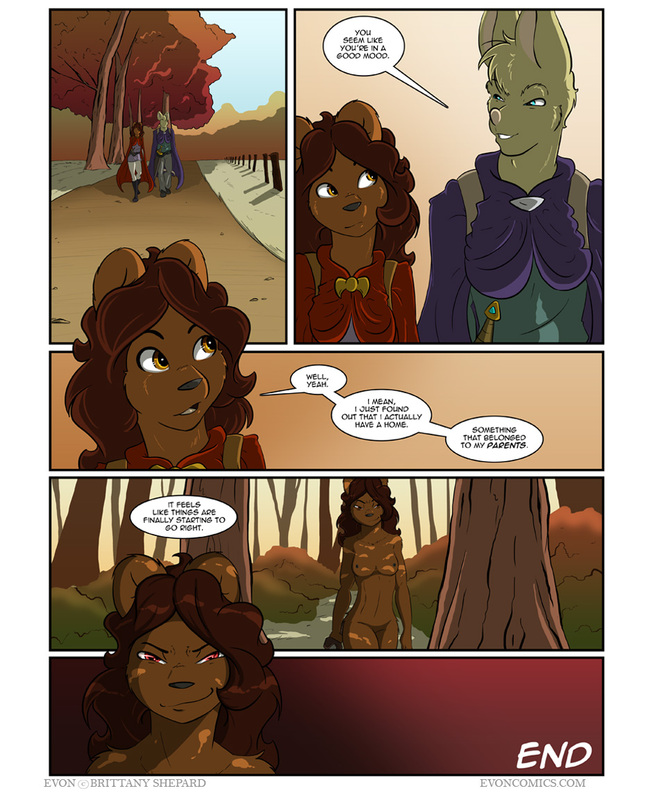 Beautifully done page but I’m sure Devon could have found clothes that fit… unless of course she’s a nudist and clothes just aren’t here style. Or like in many anime where the couple that hook up before the end of the series, one of them dies. Just look to Gurren Lagann, Trigun, or Godanner. Heck Gourry only survived because he and Lina had no memories of the one time they kissed. YEAH! Evee is still clothing free! Now we just need a three way between her, Evon, and Areth. I know it will never happen but a boy can dream. All joking aside this does not bode well for Evon. I mean we all figured Evee would come for her but now that she has found them things could go from ok to nightmare. I can just imagine the shocked look on both of them when they meet Evee, especially on Herondotis’s face, seeing a naked evil version of Evon! !Beautiful background scenery by the way. It would like to see Nega-Evon hurt or maim Areth just to shut her up. Areth was toying with Evon’s feelings in the last page and since she knew Evon liked Hero the whole time then she was probably flirting with him on purpose trying start something. Wow…are you really that bitter, mean and cynical? Who pissed in your corn flakes? I might recommend seeing someone about this. Well my other theory (that I should have mentioned) is that by flirting like that reveals Evon’s true emotions for Hero and might bring the two closer together inspite of how risky that is for both Hero and Areth. I wonder what evil Evon’s reaction would be to finding Areth. Well it looks like we both have some interesting theories of what might happen when these two meet, but I think it may depend on how much memory she has from the original Evon (not that it matters). That is part of the reason why I think Nega-Evon might hurt Areth while Posi-Evon (good Evon) has held back only giving angry glares.